Ludhiana, 3rd February, 2017: ‘Young Manch’ the Videocon Connect initiative that scouts young talents conducted the City Finale round of its fourth season. The said season of ‘Young Manch’ started with a lot of enthusiasm and gusto in October 2016 and witnessed an immensely encouraging participation from the youth. The most potential contestants of each city competed against each other at the City Finale round which was judged by an esteemed panel of judges. About 40 contestants from Jalandhar, Amritsar and Ludhiana competed against each other in the City Finale round held at Ishmeet Singh Music Academy Ludhiana. The energy at the venue was infectious and the excitement was at its peak. People were cheering for their favorite contestants and the participants were enthralled to receive such an encouraging response from the public. Sanjay, Aastha, Harchand, Jagandeep, Shivam, Karan and Sandeep emerged out to be the lucky winners in singing category whereas Ravi Kumar was adjudged as winner in the dancing category. Gopal Singh, Ankit, and Himanshu baged the top spots in acting. The performances were adjudged by Sandy Mundra from Speed Records and Gazal Tomar from Connect Broadband who declared the winners on the basis of talent, confidence and stage performance. The contestants selected after the initial audition rounds were put through the real test of their talent, when they were pitched against the chosen best of each city. City Finale was the level 2 of the 3 tier program and the winners of this level will compete at the grand finale to win the coveted title. 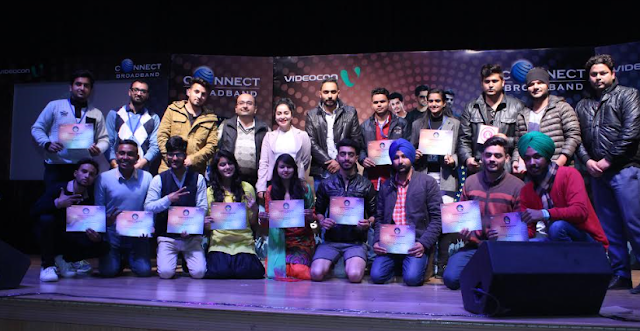 Videocon Connect has collaborated with Speed Records, leading music label in Punjab, to give the winner of the ‘Young Manch’ the right career amplification. The company will mentor the winner of the title to foray into the music industry and will also help them launch their own music album. The Mega Grand Finale of the event would be held at Indradhanush Auditorium, Panchkula on 8th Feb’2017 with blazing performances by Punjabi Youth heartthrob’s Babbal Rai, Gurnazar & Armaan Bedil. Speaking about Videocon Connect ‘Young Manch’ Mr. Arvind Bali, CEO, Connect Broadband and Videocon Telecom, Said “We have received an exceptional response from the audience with the fourth season and we take great pride in bringing polished talent to the front”. He further said “Our work doesn’t stop at just scouting the talent. Our intent is to lead them to the right path that will give their talent the right exposure”. ‘Young Manch’ is a unique platform for youngsters to project their talents in various fields. The program was set off three years ago to connect with the youth and strengthen association with a young brand that Videocon Connect is. The rigorous scouting of talent is a 3 tier format and is hosted at select Colleges and Shopping Malls of key cities across Punjab. Participants selected during the first round of auditions then compete at city levels and eventually compete with the best at the Grand Finale. The mega initiative is promoted on various platforms including Facebook and YouTube, and is hosted by famous RJs of popular Radio Stations to ensure constant engagement. The program is adjudged by a trusted panel of judges. Winners are awarded at each level of the competition and get a chance to win mobile phones/tablets and latest LED TVs.